Located in the New England region in the northeastern part of the United States, Maine is the 12th smallest of the states in terms of size and has the 9th smallest population too, making it one of the top 15 most sparsely populated states overall. Maine covers a total area of over 35,500 square miles and is home to an estimated population of around 1.34 million people. Maine has the unique distinction of being the northernmost state to the east of the Great Lakes and the easternmost state of the contiguous United States. It only has a border with one other state: New Hampshire. The other land borders of Maine are with the Canadian provinces of New Brunswick and Quebec, with the state also having a stretch of coastline on the Atlantic Ocean. Maine, like other parts of New England, is well-known for its rocky coastal areas, dense forests, seafood-based cuisine, and historic villages, with many of its towns and cities dating back to the 1600s and being founded by the first French and English settlers in the area. The state capital of Maine is Augusta, but its largest city and metropolitan area is Portland. Read on for a detailed overview of Portland, as well as brief descriptions and statistics for some of the other largest cities in Maine. Portland is the biggest city in Maine by population. It is located in Cumberland County in the southwest part of the state and is famous as a major port city for both Maine and the entire New England area. Portland covers a total area of around 69 square miles and is home to an estimated population of 67,000 people, but over half a million live in the surrounding Portland metropolitan area. This means that the Greater Portland area houses over a third of the entire state population of Maine, which makes Portland the largest metro area in all of Northern New England. 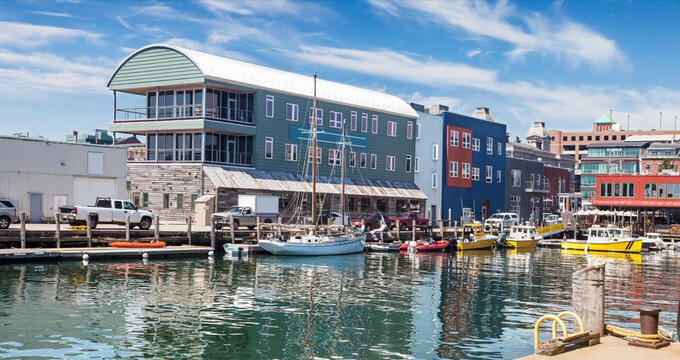 Portland is the main economic, industrial, cultural, and touristic center of the state of Maine, with tourism helping to play a big part in the city's economy. The Old Port area, which is home to many historic buildings and landmarks and has been renovated into a popular dining and nightlife location, is particularly popular with visitors, and the Port of Portland itself is still in use and plays a major role as the biggest tonnage seaport in all of New England. This city was founded back in 1632 by English settlers, who chose to name it after an island called Portland in the area of Dorset, England. Portland, Oregon was named after Portland, Maine. Lewiston is the second biggest city in the state of Maine. This city is located in Androscoggin County in the southwest part of the state. Lewiston is located not too far south of Augusta, which is the Maine state capital, and is directly north of Portland, which is the state's biggest city, so has acted as a key gateway between these two locations over the years. Lewiston covers a total area of 35.54 square miles and is home to around 36,000 people. It was founded back in the late 1700s and originally known as Lewistown, but was changed to Lewiston when it was officially incorporated. Lewiston is home to Maine's only basilica, the Basilica of Saints Peter and Paul, and is perhaps best-known for the local activities of rail tycoon Benjamin Bates, who helped the city to develop greatly in the 1800s. Bangor is the third biggest city in the state of Maine. This seat is located in Penobscot County, of which it is the county seat, in the central-southern part of the state. Bangor covers an area of over 34 square miles and is home to an estimated population of 33,000 people, with its metropolitan area being home to over 150,000 people. Bangor was founded in the late 18th century. The origin of its name is unknown, but it's possible that it was named after a city of the same name in Wales. This city is known as the 'Vegas of the Northeast' due to its huge casino complex, with Bangor also being home to the oldest state fair in Maine and many interesting museums, buildings, and public art installations. South Portland is the fourth largest city in the state of Maine. South Portland is located in Cumberland County, and as its name indicates, it is located just south of Portland, which is the biggest city in Maine. South Portland is not officially a part of Portland, however, but is part of the Portland - South Portland - Biddeford metropolitan area. The population of South Portland is around 25,000 and the city covers around 14 square miles. South Portland was established as a settlement back in the early 1600s. This city is home to several interesting historic buildings and locations of interest like the Portland Breakwater Light, the Portland Harbor Museum, the South Portland Farmers' Market, and the annual Art in the Park special events. Auburn is the fifth biggest city in the state of Maine. This city is located in Androscoggin County in the southwest part of the state. Auburn is the county seat of Androscoggin County and has close ties with the local city of Lewiston, which is just on the other side of the Androscoggin River to Auburn. Together, these two cities are known by locals and Maine natives as the 'Twin Cities'. Auburn covers an area of over 65 square miles and is home to around 23,000 people. This city was first settled in the late 1700s but didn't become known as Auburn until the mid-19th century. Auburn has an interesting history associated with shoe manufacture, with the Lewiston-Auburn Shoe Strike of 1937 being one of the most important labor disputes to ever occur in all of Maine when thousands of shoe-making workers went out on strike.